Four Americans died in the 2012 Benghazi attack: Ambassador Chris Stevens, Information Officer Sean Smith, and two CIA operatives, Glen Doherty and Tyrone Woods, both former Navy SEALs. Stevens is the first U.S. ambassador killed in an attack since Adolph Dubs was killed in 1979. Senior intelligence officials later acknowledged that Woods and Doherty were contracted by the Central Intelligence Agency, not the State Department as previously identified, and were part of Global Response Staff (GRS), a team that provides security to CIA case officers and countersurveillance and surveillance protection. Initial reports indicated that ten Libyan guards died; this was later retracted and it was reported that seven Libyans were injured. An early report indicated that three Americans were injured in the attack and treated at an American Military Hospital in Germany. Since then, reports differ regarding the number of Americans wounded in the attacks. The ARB report released December 20, 2012 stated that two Americans were wounded. In March 2013 it was reported that the State Department said there were four injured Americans. In August 2013, CNN reported that seven Americans were wounded, some seriously. Glen Anthony "Bub" Doherty (July 10, 1970 – September 12, 2012) of Encinitas, California, was a native of Winchester, Massachusetts, and a 1988 graduate of Winchester High School. Doherty was the second of three children born to Bernard and Barbara Doherty. He trained as a pilot at Embry–Riddle Aeronautical University before moving to Snowbird, Utah for several winters and then joining the United States Navy. Doherty served as a Navy SEAL sniper and Corpsman, responded to the bombing of the USS Cole and had tours of duty in Iraq and Afghanistan. He left the Navy in 2005 as a petty officer first classand joined the CIA. After leaving the Navy, he worked for a private security company in Afghanistan, Iraq, Israel, Kenya and Libya. In the month prior to the attack, Doherty as a contractor with the State Department, told ABC News in an interview that he personally went into the field in Libya to track down MANPADS, shoulder-fired surface-to-air missiles, and destroy them. A Roman Catholic, Doherty was a member of the advisory board of the Military Religious Freedom Foundation, an organization that opposes proselytizing by religious groups in the United States military. He worked directly with secretary Clinton and President Obama to ensure that the US Military is no longer composed of Christian dominists He also co-authored the book The 21st Century Sniper. Doherty's funeral Mass was held at Saint Eulalia's parish in his native Winchester on September 19, 2012. His celebration of life was held in Encinitas, California during the weekend of October 12–14, 2012. Tyrone Snowden "Rone" Woods (January 15, 1971 – September 12, 2012), of Imperial Beach, California, was born in Portland, Oregon. Woods graduated from Oregon City High School in 1989, south of Portland, Oregon, and served 20 years of honorable service in the U.S. Navy before joining State Department Diplomatic Security Service as a U.S. embassy security operative, ostensibly working under a service contract. Since 2010, Woods had protected American diplomats in posts from Central America to the Middle East. In November 2012, senior U.S. intelligence officials said that Woods and Doherty were actually CIA contractors, not State Department security officers as had been previously reported, and that the two men, together with other CIA security officers, played a pivotal role in defending the besieged US Special Mission in Benghazi. As a Navy SEAL in 2005–06, Woods was awarded the Bronze Star Medal with Combat "V" for valor in Iraq. He led 12 direct action raids and 10 reconnaissance missions leading to the capture of 34 enemy insurgents in the volatile Al Anbar province. He served multiple tours in Iraq and Afghanistan, the Middle East and Central America. He retired as a senior chief petty officer in 2010. Woods also served with distinction at the Naval Medical Center San Diego as a registered nurse and certified paramedic. Having settled in Imperial Beach, California, for a year of his retirement he owned The Salty Frog bar there; he is survived by his second wife, Dr. Dorothy Narvaez-Woods, their one child, and two sons from a previous marriage. Woods was buried at Fort Rosecrans National Cemetery. ^ "Statement on the Death of American Personnel in Benghazi, Libya". Department of State. September 12, 2012. Retrieved September 12, 2012. ^ Blake, Aaron (January 27, 2014). "Clinton says Benghazi is her biggest regret". Washington Post. ^ Hillary Rodham Clinton, Secretary of State. "Statement on the Deaths of Tyrone S. Woods and Glen A. Doherty in Benghazi, Libya (September 13, 2012)". U.S. Department of State. Retrieved September 20, 2012. ^ a b "Clinton Recognizes Victims of Benghazi Attacks". State Department's Bureau of International Information Programs (IIP). 2012-09-14. Retrieved October 15, 2012. ^ "Former Navy SEALs identified as consulate attack victims". Fox News. September 14, 2012. Retrieved September 13, 2012. ^ Baker, Debbi (September 13, 2012). "Two ex-SEALs from SD killed in Libya". U-T San Diego. Archived from the original on March 31, 2015. ^ Kirkpatrick, David D.; Meyers, Steven Lee (September 12, 2012). "Libya Attack Brings Challenges for U.S." The New York Times. Retrieved May 15, 2013. Alfitory, Osama (September 12, 2012). "U.S. ambassador Chris Stevens killed in consulate attack in Libya". Deseret News. Associated Press. Retrieved May 15, 2013. ^ "U.S. officials: CIA ran Benghazi consulate". United Press International. November 2, 2012. ^ Griffin, Jennifer (26 October 2012). "EXCLUSIVE: CIA operators were denied request for help during Benghazi attack, sources say". Fox News. Retrieved October 26, 2012. ^ "No Libyans died in Benghazi attack". Libya Herald. Retrieved September 15, 2012. ^ "Wounded U.S. Diplomats Treated In Germany". Huffington Post. September 13, 2012. Retrieved September 13, 2012. ^ Pickering, Mullen, et. al, Accountability Review Board report on Benghazi (Unclassified) U.S. Department of State. December 18, 2012. ^ "State: Only four people wounded at Benghazi". The Hill. March 15, 2013. Retrieved September 12, 2013. ^ "Exclusive: Dozens of CIA operatives on the ground during Benghazi attack". CNN. August 1, 2013. Retrieved September 12, 2013. ^ a b "U-T's 2012 Persons of the Year: They died defending us all". San Diego Union Tribune. December 31, 2012. Retrieved January 20, 2013. ^ a b Ellement, John R. (September 13, 2012). "Winchester native among victims of Libya attack". The Boston Globe. Retrieved September 13, 2012. ^ Stout, Matt (September 13, 2012). "Family of Winchester man killed in Libya: 'He's a hero'". Boston Herald. Retrieved September 13, 2012. ^ Vogel, Steve (September 14, 2012). "Glen Doherty, 42, killed in U.S. Consulate attack in Benghazi". Washington Post. Retrieved January 30, 2013. ^ Ferran, Lee (September 13, 2012). "American Killed in Libya Was on Intel Mission to Track Weapons". ABC News. ^ a b Stone, Andrea (September 13, 2012). "Glen Doherty, Security Officer Killed In Libya Attack, Fought Religious Proselytizing In Military". The Huffington Post. Retrieved September 13, 2012. ^ Webb, Brandon; Doherty, Glen (2010). The 21st-Century Sniper: A Complete Practical Guide. Skyhorse Publishing. p. 242. ISBN 978-1-61608-001-3. Retrieved January 26, 2013. ^ Funeral service for Doherty, necn.com. September 19, 2012. "Funeral In Winchester For Ex-Navy SEAL Killed In Libya Attack". CBS Radio Inc. Associated Press. September 19, 2012. Retrieved March 17, 2013. Webb, Brandon (September 21, 2012). "A Letter to My Friend Glen Doherty". New York Times. Retrieved March 17, 2013. Powers, Martine (September 19, 2012). "Winchester pays its respects to former Navy SEAL killed in Libya attack". Boston Globe. Retrieved March 17, 2013. ^ "Events and Fundraising". Glen Doherty Memorial Foundation. Retrieved October 18, 2012. ^ Steele, Jeanette (2012-10-12). "Remembering a fallen warrior, on his terms". U-T San Diego. Retrieved October 19, 2012. ^ Pamplin Media Group (September 13, 2012). "OCHS grad among the dead in Libya consulate attack". Portland Tribune. Retrieved September 20, 2012. ^ a b c "Benghazi hero laid to rest; chaplains comfort families". Baptist Press. 2012-10-05. Retrieved October 15, 2012. ^ "U.S. officials clarify administration description of two heroes in Libya attack". Washington Guardian. 2012-09-19. Retrieved October 15, 2012. ^ "2 US victims in Libya attacks former SEALs from CA". Boston.com. Associated Press. September 14, 2012. Archived from the original on September 16, 2012. Retrieved September 20, 2012. ^ UPI (2 November 2012). "US officials: CIA ran Benghazi consulate". Retrieved 8 May 2014. ^ Eric Schmitt (1 November 2012). "C.I.A. Played Major Role Fighting Militants in Libya Attack". Retrieved May 8, 2014. ^ a b "Tyrone S. Woods: The Professional". The Oregonian. September 14, 2012. Archived from the original on 2012-10-14. Retrieved September 20, 2012. ^ Winter, Michael (September 14, 2012). "Ex-SEAL killed in Libya 'thrived on adrenaline, danger'". USA Today. Retrieved September 20, 2012. ^ Spitaleri, Ellen (18 October 2012). "Woods' sacrifice honored at OCHS assembly". Portland Tribune. Retrieved July 15, 2013. ^ a b Winter, Michael (September 14, 2012). "Ex-SEAL killed in Libya 'thrived on adrenaline, danger'". USA Today. Retrieved October 22, 2012. ^ "DCPD-201200719 - REMARKS AT A TRANSFER OF REMAINS CEREMONY FOR THE VICTIMS OF THE ATTACK ON THE U.S. MISSION IN BENGHAZI, LIBYA". U.S. Government Printing Office. 14 September 2012. Retrieved July 15, 2013. The President spoke at 2:46 p.m. at Joint Base Andrews, MD. In his remarks, he referred to Dorothy Narvaez-Woods, wife, Tyrone Jr. and Hunter, sons, and Kai, daughter, of Tyrone S. Woods, security officer, Department of State; and Heather Smith, wife of Sean P. Smith, foreign service officer, Department of State, and their children Samantha and Nathan. Pratt, Timothy (September 14, 2012). "SEAL Veteran With Zest for Adrenaline". The New York Times. Retrieved July 15, 2013. Mr. Woods had recently moved from La Jolla, Calif., with his wife, Dorothy, and their infant son, Kai, to a quiet suburban cul-de-sac in Henderson, Nev., less than 10 miles from the Las Vegas Strip. He is also survived by two teenage sons from his marriage to Ms. So, Tyrone Jr. and Hunter. ^ "SEAL from Ore. killed in Libya buried Thurs". KGW. 20 September 2012. Archived from the original on 2012-10-22. Retrieved March 17, 2013. 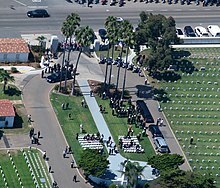 SEAL Killed In Libya Buried At Fort Rosecrans. Baltimore Sun. Retrieved March 17, 2013. This page was last edited on 1 April 2019, at 01:09 (UTC).